Where’s the Rest of Me? The Ronald Reagan Story. New York: Duell, Sloan and Pearce, 1965. First edition of Reagan’s biography covering his years in Hollywood. Octavo, original black cloth. 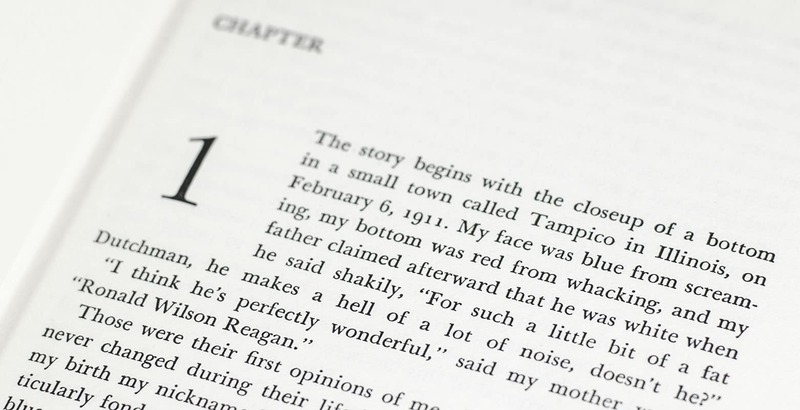 Inscribed by the author on the front free endpaper in a contemporary hand, “To Oliver Peterson With Every Good Wish Sincerely Ronald Reagan.” Reagan has also corrected in his hand the word “Honey” opposite the title page to “Nancy.” Fine in a near fine jacket. Jacket design Ned Glattauer. "Where's the rest of me" is Reagans famous line from the hit movie "King's Row". The release of his autobiography coincided with his run for the California governorship. Ronald Reagan Autographed Note Signed. Autograph note signed by Ronald Reagan on his personal letterhead as follows, “20 Sept. ’89 Dear Ford and Norma, Thanks for your letter and generous words, I’m more grateful than I can say. Thank you too for your prayers. They were answered & I have had an almost instant recovery, at home and feeling just great. Nancy sends her best to you. Again thanks & Best Regards, Ron.” In September if 1989, President Ronald Reagan underwent routine brain surgery for the removal of a subdural hematoma resulted from a horse-back riding accident. An accomplished rider, he was thrown from a bucking horse while visiting the ranch of personal friend William Wilson in Cananea, Mexico. Matted and framed. 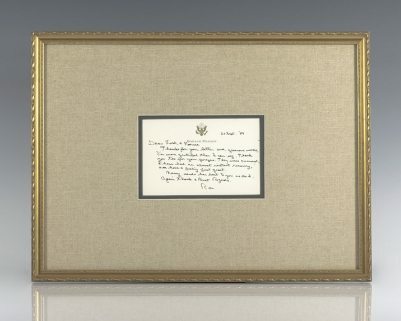 Affixed to the back of the frame is the envelope in which the letter was sent addressed in Reagan’s hand: “Mr. and Mrs. Ford B. Ford 12115 Breckenridge Lane Woodbridge, Va. 22192.” Reagan has also signed his name in pen in the return address. The entire piece measures 18 inches by 13.5 inches. Rare and desirable. First edition. Octavo, original black cloth. Warmly inscribed by the author on the front free endpaper, “To Ray + Gladys In God We Trust Ronald Reagan.” Reagan has also corrected “Honey” to “Nancy” in his own hand, on the verso of the half title page. Fine in a near fine dust jacket with light wear to the extremities. 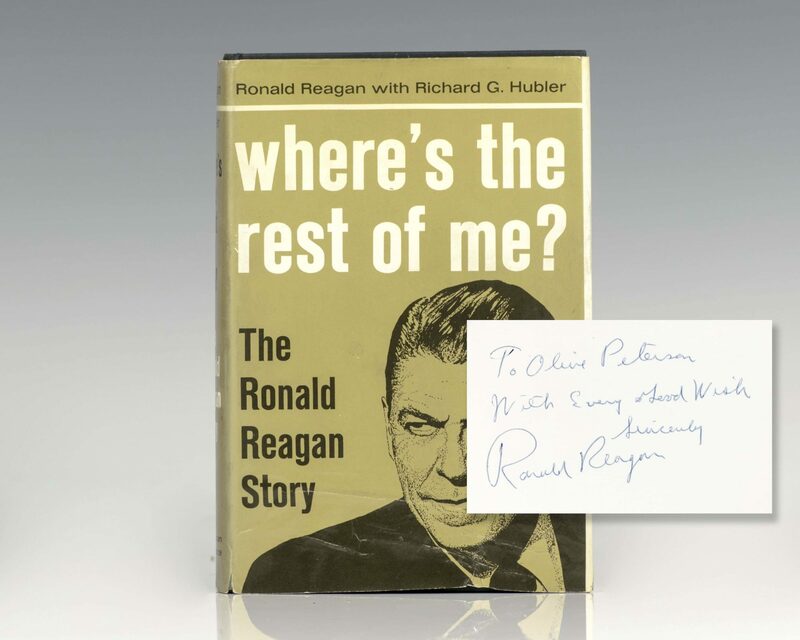 Also, comes with Peter Pierce’s book The Presidential Journey of Ronald Wilson Reagan, signed by Peter Pierce. First edition. Octavo, original black cloth. Signed by the author on the front free endpaper in a contemporary hand, “Best Regards Ronald Reagan.” Reagan has also corrected in his hand the word “Honey” opposite the title page to “Nancy.” Fine in a very good dust jacket with some rubbing and closed tears. Jacket design Ned Glattauer. First edition of President Reagan’s collection of speeches. Octavo, original half cloth, pictorial endpapers, illustrated. 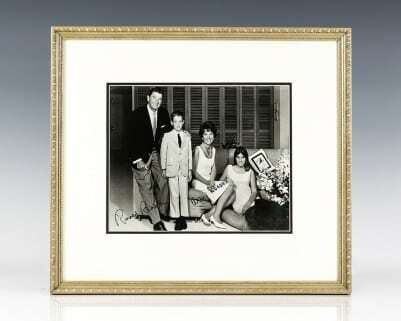 Presentation copy, inscribed by Ronald Reagan on the dedication page, “To Peter Vynne- With Very Best Wishes and Regards Ronald Reagan March 22, 1990.” Additionally signed by First Lady Nancy Reagan, President George H.W. Bush, who served as Vice President in the Reagan Administration and Mikhail Gorbachev, former Soviet premier, counterpart to Reagan in the 1980s and Nobel Peace Prize winner. Near fine in a fine dust jacket. Jacket design by Barry Littmann. Housed in a custom half morocco clamshell box. An exceptional piece of history. Abortion and the Conscience of the Nation. First edition. Octavo, original boards. Fine in a near fine dust jacket. Signed by Ronald Reagan on front free endpaper. Afterwords by C. Everett Koop and Malcolm Muggeridge. Rare signed. 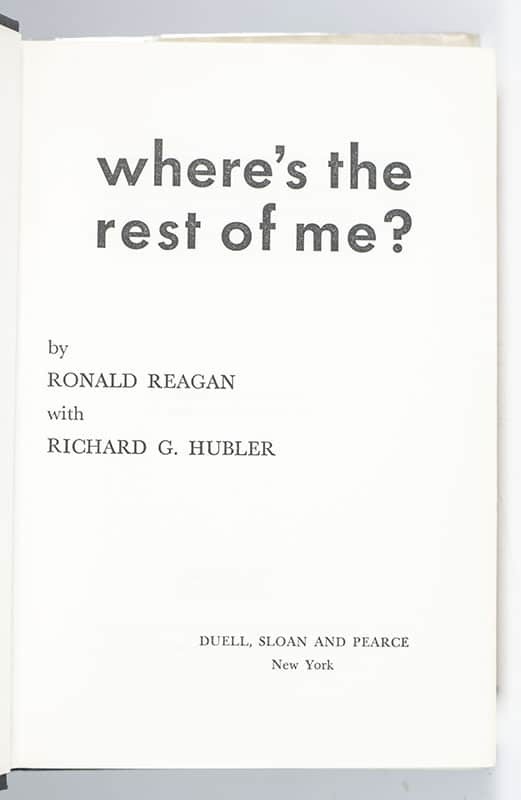 First edition of the 40th President of the United States’ memoir. Octavo, original half cloth, illustrated. Presentation copy, inscribed by the author on the half-title page, “To Edward- With Best Wishes. Ronald Reagan Oct. 29- ’92.” Fine in a near fine dust jacket. Jacket design by Robert Anthony, Inc.